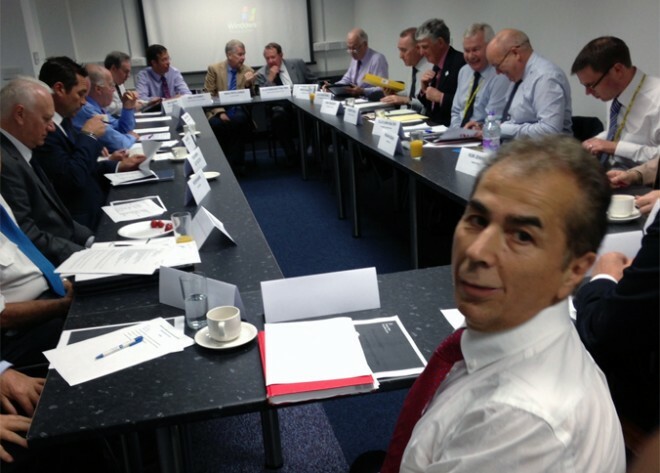 Key stakeholders meet at Comtek’s Deeside HQ to discuss the economic case for Wrexham to Bidston railway electrification. Secretary of State for Wales David Jones MP and Lord Barry Jones prepare for the meeting to get underway. 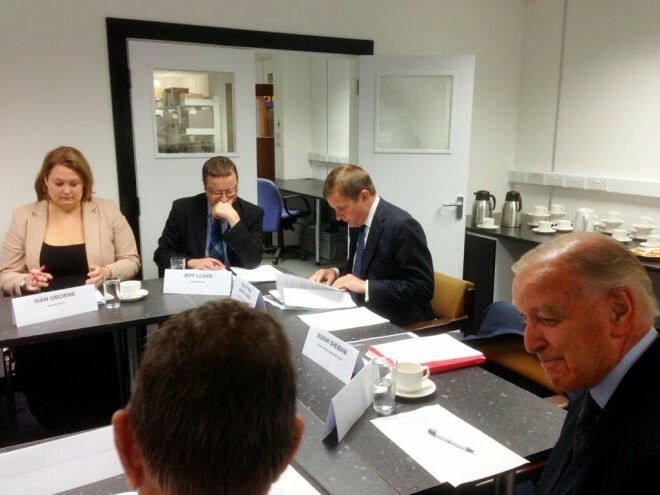 Secretary of State for Wales, David Jones continued to underline his ambition for improving rail infrastructure in North Wales as he assembled a group of key stakeholders to discuss the business case for electrification of the Wrexham to Bidston line at Comtek’s Deeside HQ. Hosted in Comtek’s Nortel Training lab, Mr Jones and Comtek’s CEO Askar Sheibani welcomed Ian Lucas MP for Wrexham and Shadow Minister for Foreign Affairs, Lord Barry Jones and members of the North Wales Economic Ambition Board, along with representatives of the Liverpool Local Enterprise Partnership and the Wirral Waters Enterprise Zone to the roundtable meeting to gather views on how improving the rail links between enterprise zones in North East Wales and North West England could benefit the local economy. The roundtable meeting was a great success and information provided by the representatives of the local authority and business community present from both sides of the border will be used to further strengthen the economic case for electrification of the Wrexham to Bidston line.